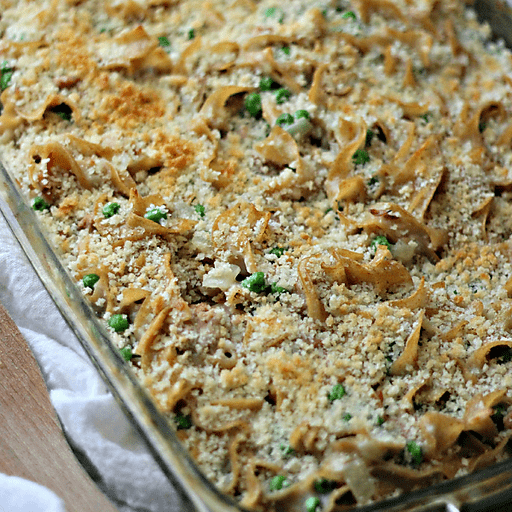 Tuna Noodle Casserole is one of those staple meals in just about everyone’s house! It's quick, simple and a family favorite. We've taken the non-traditional route and made the sauce from scratch, and it is totally worth the extra 10 minutes! 1. Preheat the oven to 375°F. Cook the egg noodles according to package directions. Drain and place in a greased baking dish. 1. In the meantime, heat butter and oil in a large saucepan to medium-high. Add chopped onion and saute 5-6 minutes, until soft. Stir in the flour and cook for 2-3 minutes. Slowly stir in the milk, whisking as you pour. Whisk in the chicken broth. Increase the heat to high. When the sauce starts to boil, turn back to medium-high. Simmer, whisking regularly, until sauce has thickened. Season with salt and ground black pepper. Stir in the tuna, peas and parmesan cheese and cook on medium-high until cheese has melted. 1. Pour sauce over noodles and stir until incorporated. Evenly spread Panko breadcrumbs over the top of the casserole. Bake in preheated oven for 20 minutes. 1. Turn oven to a low broil and allow breadcrumbs to brown. Remove from oven and let sit a few minutes before serving. Per Serving: Calories 260, Total Fat 7g (Saturated 2.5g, Trans 0g), Cholesterol 35mg, Sodium 540mg, Total Carbohydrate 33g (Dietary Fiber 4g, Sugars 4g), Protein 20g, Vitamin A 10%, Vitamin C 6%, Calcium 8%, Iron 8% *Nutritional values are an approximation. Actual nutritional values may vary due to preparation techniques, variations related to suppliers, regional and seasonal differences, or rounding.